Founded in 1891, it later changed its name in 1996 from Nobelpharma to Nobel Biocare. Aquiring the American firm Steri-Oss Inc. in 1998, Nobel Biocare has become the best in esthetic and restorative dentistry. With more than 40 years of research, innovation, and experience to their name, Nobel Biocare has undeniably made a mark in the fields of restorative, prosthetic, esthetic, and implant dentistry; being well known as to have been the pioneers in the industry by introducing the dental implant, as well as CAD/CAM based prosthetics. Having several producers located all around the globe (Sweden, US, Canada, Japan), Nobel Biocare is the largest manufacturer of implants to date. All products undergo preclinical testing and validation to the highest standards before being distributed; this in turn assures patients the safest and most improved treatment. 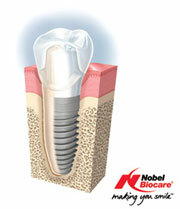 The All-on-4 system was developed by Dr.Malo/Nobel Biocare to have 4 implants support one complete prosthesis/denture. This offers edentulous patients all the ease, efficiency, convenience, and satisfaction they need. This type of system can be beneficial in that it can provide stability of the restoration, even at a low bone volume. Proven to have had basically no negative side effects on the bone, this system has very good clinical results. In some cases, this type of system may be done in only one day; saving the patient time, energy, and similarly, the stress of dental treatment. In conjunction with Nobel Biocare, the Steri-Oss system provides a simplified, high-quality implant with 4 four different types that can be used for single or multiple tooth replacement using bridges, detachable reconstructions and overdentures. Evolved from the original implant system that was first introduced, this is known to be the safest and most versatile implant system due to the 45 years of its effective clinical usage. This type of system is used most effectively in medium to dense bone. This system is known to have high stability in soft to medium bone. It is the preferred implant system for complete restorations like All-on-4 because of its short drilling protocol. This system provides high initial stability, especially in extraction sockets and soft bone. This is used by the most advanced implantologists. This system can deliver optimal initial stability in soft and hard bone. Specifically, NobelReplace Platform and NobelReplace Conical Connections provide platform shifting that is designed to extend the soft tissue volume yielding the most natural-looking esthetics.